There are lots of things to see in Sedona…majestic red rock canyons, the tranquil waters of local waterways and Indians ruins from ancient cultures that inhabited this area over a millennium ago. On this adventure you will see not only the beautiful rocks that surround Sedona but also where early civilizations chose to make their homes. 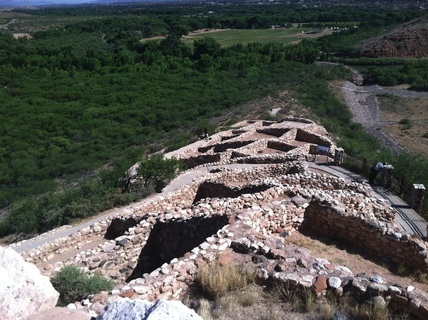 There are three main types of ruins that were built here in the Verde Valley and on this archeological adventure you will see them all. We will visit three very unique and different Indian ruin sites. Your adventure begins with a visit to Montezuma Castle where you will see the twenty rooms that make up the magnificent cliff dwelling along the banks of Beaver Creek. Our next stop is a visit to the nearby Montezuma Well where you will see the cool rooms that were known as cave dwellings. On our final stop we take you to Tuzigoot National Monument that at one time encompassed over 110 rooms in a pueblo or pit house style of Indian architecture. This is a very informative adventure for those really interested in early civilizations of the area. The duration of this tour is 6 hours.